A fan of web comics? Enjoy sword fights, science, and villains? Then meet Nimona, a shape-shifting girl with serious power and an unquenchable thirst for evil. Lord Blackheart may be the kingdom’s resident bad guy, but Nimona is a huge fan and quickly joins his team. With his brains and her brawn, they just might be able to take down Sir Goldenloin and save the kingdom! But things start to spiral out of control when Nimona’s power becomes sporadic, and Blackheart realizes she might not be who she claims. I grabbed Nimona because—hey, I know that drawing style! Chances are (if you’re a Tumblr addict like me) you’ll recognize it, too. This may be Noelle Stevenson’s debut graphic novel, but she’s no novice. With several published comics and gigs with heavyweights like Marvel, DC, and Lumberjanes, it’s clear she’s in her element. 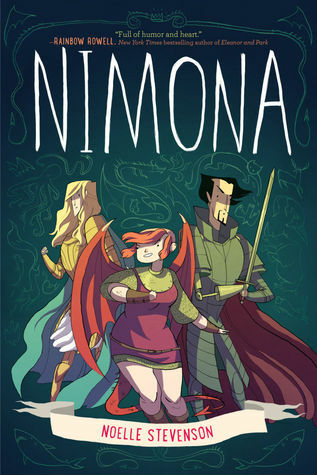 Chock full of plot twists and one-liners, Nimona has everything you want in a comic—a badass lead character, an unpredictable plot, and a big helping of sarcasm. This novel had me laughing out loud and on the edge of my seat. I love Stevenson’s mix of science and magic. She artfully balances the lighthearted humor with the heavier themes that emerge towards the end of the novel. Besides, it’s fun to side with the bad guys every once in a while. I devoured this in one sitting and immediately called my sister to tell her about it. It’s too good not to be shared! My only disappointment is that Stevenson doesn’t have another full-length graphic novel out yet. For now, you can find me obsessively checking her Tumblr.